Correction: The print version of this story had a misspelling of the González name. The error has been fixed in this online version. You say hot sauce. Cristina González Alcalá says salsa. That’s what she calls her dad’s family recipe being bottled in Akron as Not Yo’ Daddy’s. It has been a staple at every González family event, get-together and cookout in Cristina’s hometown of Durango, Mexico. But even the origin story for her company has an origin story. Cristina’s grandmother had a couple friends who made a sauce similar to this and brought it to parties. Her grandmother loved it so much that Cristina’s father tried to replicate it for her. Cristina’s mom’s grandmother had a similar recipe, with some of the same ingredients but a different method of preparation. Cristina’s father, Jorge González Cano, took inspiration from the two recipes to create what is now a family tradition. Jorge had the idea to sell the hot sauce, but after perfecting the recipe, going through testing, coming up with a name and designing a logo, he ran into a problem in the trademarking process. The name was Kika Pica. Pica means spicy, and Kika was Cristina’s nickname in school. When he attempted to trademark it, the name was too close to several other product names, and he was asked to change it. Jorge, who was very set on the name, decided the trademarking process was too difficult and gave up. Eventually, Cristina went to college on a golf scholarship in Louisville, Kentucky where nothing was spicy enough. After much convincing, Jorge finally gave Cristina the recipe, but she had to promise to never share the recipe. To this day, Cristina’s wife and business partner, Richelle Wardell is the only person without the Gonzales surname who knows the recipe. When Cristina moved to Akron, she started to make the recipe more often, and she began to bring it to parties and events to share with friends. “At one point, people started saying, ‘You should sell it. Let me pay you for this’,” Cristina says. “I was adamant to call it a salsa. Because I’m like, ‘You Americans will learn that this is called a salsa still in Mexico, because it’s Mexican,” Cristina says. They compromised and called it “Not Yo’ Daddy’s Hot Salsa.” Unfortunately the “hot” was not enough of a disclaimer, and Richelle and Cristina laugh, recalling the reactions of the initial guinea pigs who got a spicy surprise. Encouraged, they took 85 containers to Better Block on a Friday and by Saturday, they were sold out. Riding on a wave of confidence and adrenaline, they prepped 50 more to sell at the farmers’ market the next day. Shortly after that, they made a big switch. They had been using plastic deli containers for the salsa but switched to bottles, which they sealed with wax, a clever idea Richelle had. This is when they finally started calling it hot sauce. “Because people were on fire,” says Cristina. “Because we were hurting people,” says Richelle. Not Yo’ Daddy’s has been in business for a year and a half. 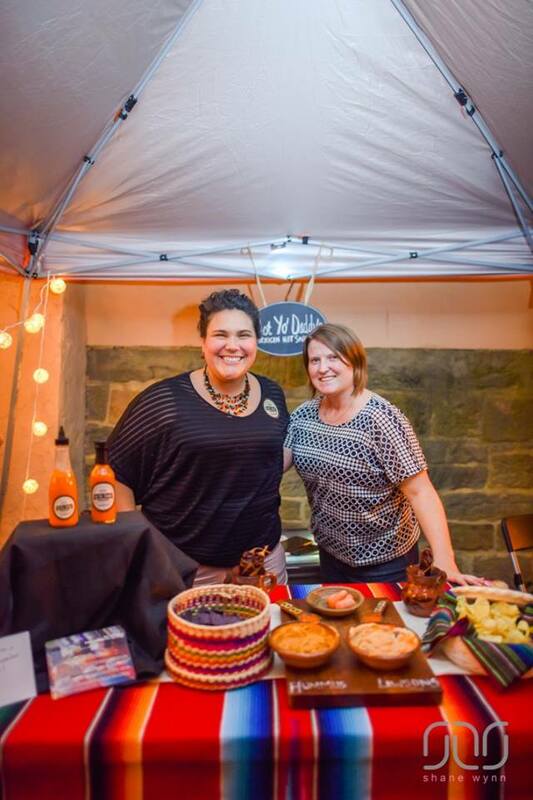 This summer they sold their sauce at many local festivals including Akron Farm & Flea Market, Entrovation (Cleveland), PorchRokr and Cuyahoga Falls Better Block. They are now in the process of streamlining things so that they can sell their product on grocery store shelves. Not Yo’ Daddy’s is currently for sale at Urban Eats, Sweet Mary’s Bakery and Stray Dog. Not Yo’ Daddy’s uses Sweet Mary’s Bakery kitchen to make their product, and Sweet Mary’s uses Not Yo’ Daddy’s exclusively for all their hot and spicy needs. Cristina and Richelle credit the strong sense of community amongst their fellow entrepreneurs in Akron. “Everyone is really excited about everyone else’s product. It’s fun to get together and talk with them about how things are going and where their businesses are going and what they’ve been up to and sharing ideas,” says Richelle. 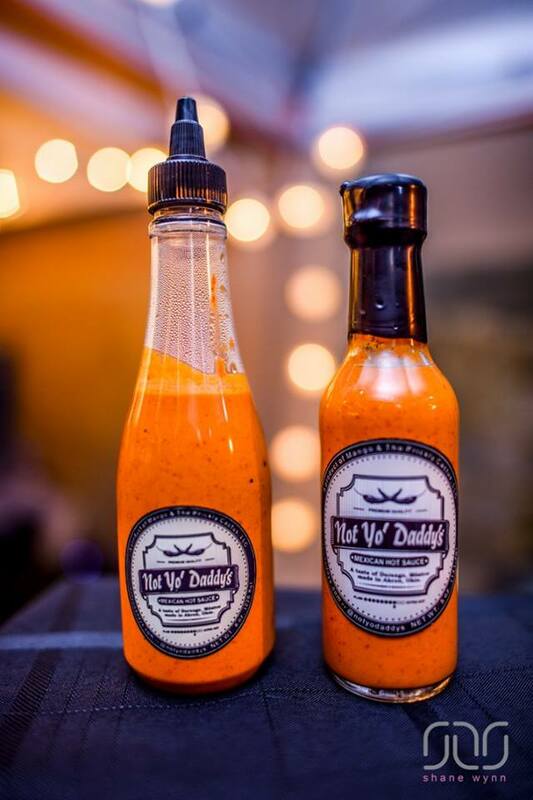 For more information on Not Yo’ Daddy’s hot sauce, visit their website at notyodaddys.com, or email quieromas@notyodaddys.com. Sophie treats Not Yo’ Daddy’s like salsa, and all other “salsas” in her refrigerator have been demoted to backups. The Devil Strip’s small business and entrepreneur section is possible thanks to the support of The Fund for Our Economic Future and the Burton D. Morgan Foundation. You can learn more about being an Akron entrepreneur by visiting akronisforentrepreneurs.org. it just might be my favorite hot sauce…salsa. Yes, it is so spicy, and so delicious, and its pretty to look at.